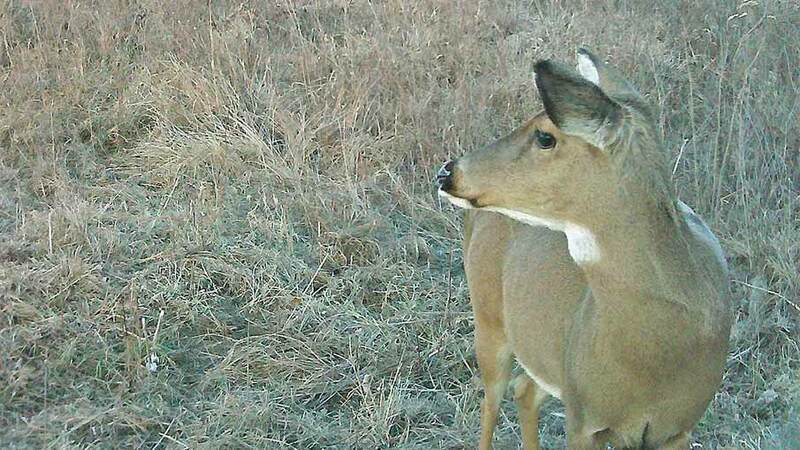 Whitetail Hearing – Supernatural or So-So? It’s a common story among bowhunters, a barely audible sound of an arrow scraping against its rest alerted a deer and thwarted a successful hunt. Surely an animal that can detect such faint noises must have almost supernatural hearing ability. When you add this to their incredible sense of smell, it’s no wonder why whitetails are among the most difficult big-game animals to harvest with stick and string. While there is ample evidence to support the whitetail’s incredible sense of smell, until recently little was known regarding their sense of hearing. Thanks to a landmark study by researchers at the University of Georgia (UGA), we now have a much better understanding of what deer can hear. Before discussing the results of the study, let’s review the basics of sound. Sound is simply the vibration of air molecules. The speed at which the air molecules vibrate describes the sound’s frequency. The faster the vibration, the higher the frequency. Frequency is measured in hertz. A sound’s loudness is described as its intensity and is measured in decibels. The vehicle-mounted deer whistles used by motorists in hopes of preventing deer-vehicle collisions are supposed to emit ultrasonic sounds. Manufacturers claim these devices can be heard by deer but not humans. However, prior to the UGA study, there was no scientific evidence to support or refute this claim. To study deer hearing, in 2005 a group of UGA wildlife researchers led by doctoral student Gino D’Angelo, under the guidance of Drs. Bob Warren and Karl Miller, designed a sound-testing booth at the UGA deer research facility in which they could monitor the brainwaves of deer in response to various sounds. The deer used in the study ranged in age from 6 months to 4 ½ years. Using specialized computer software, the researchers could interpret signals transmitted by electrodes inserted just below the deer’s skin and determine what frequencies of sound deer could hear. They tested frequencies ranging from 250 hertz to 30,000 hertz, and learned that deer were capable of hearing throughout this range. In general, deer hearing appears very similar to humans, except in the high frequencies. Although the upper end of human hearing is about 20,000 hertz, deer can hear frequencies to at least 30,000 hertz. But, these high-frequency sounds must be louder because high-frequency sounds don’t travel as far as low-frequency sounds. Although deer can hear ultrasonic sounds, their hearing is most sensitive to moderate frequencies between 4,000 to 8,000 hertz. Humans also hear best at moderate frequencies between 2,000 to 5,000 hertz, which corresponds to the normal frequency of human speech. Former UGA graduate student Thomas Atkeson found that most deer vocalizations ¬including bawls, bleats, grunts, grunt-snort-wheezes, and snorts were comprised of low to moderate frequencies between 1,000 to 8,000 hertz. Interestingly, the strongest frequency of sound from individual calls averaged 3,000 to 6,500 hertz, which is consistent with the estimated range of peak hearing sensitivity in deer. Grunts are probably the most common vocalization used by deer. The low to moderate frequency of this call makes it audible even at relatively long distances. Hunters are most familiar with the tending grunt, which bucks use during their courtship of an estrus doe. The tonality of this vocalization depends on a buck’s level of excitement or physical exertion. Tending grunts are moderately pitched, several seconds in duration, and often repeated in succession. Lower-frequency grunts are used by dominant deer of both sexes to intimidate deer of lower social rank. The “grunt-snort-wheeze” is the most aggressive vocalization made by deer and often precedes a battle between bucks. It includes the low-frequency grunt, a short snort from the nostrils, followed by a prolonged wheeze through pinched nostrils. Often, this vocalization, combined with aggressive body postures, is enough to establish dominance and avoid conflict. If not, a serious confrontation is likely to follow. The researchers also analyzed the sound emitted from several commercial grunt calls to determine how they compared to deer hearing capabilities. Interestingly, all produced similar sounds with frequencies ranging from about 100 to 6,000 hertz. The strongest frequency for each was in the 3,000 to 4,000 Hertz range, which is well within the deer’s peak hearing sensitivity. The results of this study have numerous implications for hunters. First, with the exception of ultrasonic frequencies, a deer’s hearing ability is very similar to ours – at least in the general range of sounds we both can hear. However, the size, shape and maneuverability of their ears allow deer to pinpoint sounds quicker and better than humans. Second, low-frequency sounds like footsteps travel farther and can be heard better by deer at greater distances than high-frequency sounds like an arrow scraping against its rest. It should be noted that human speech is a moderate frequency sound that not only travels far, but also is well within the peak hearing range of deer. So, speak quietly in the woods – the deer are listening. Third, sound does not travel well in the environment and, thus, you are probably not “speaking the language” with as many deer as you may think. Like many hunters, you have probably called to a buck at fairly close range that clearly did not hear you until you stepped on the gas and called a bit louder. However, it’s still a good idea to call softly at first to avoid alerting deer that are nearby. Finally, while a deer’s overall hearing ability is not much different than ours, it is far more”in-tune” with its surroundings because their survival depends on the use of their senses to detect potential predators far enough in advance to escape unharmed. Just think about it, if your life depended on correctly identifying every sound in your environment, wouldn’t your ears be far more “in-tune” with your surroundings? Clearly, the more we learn the more questions we have. That’s why we continue to follow the Whitetail Science. Brian Murphy is an avid hunter, wildlife biologist and CEO of the Quality Deer Management Association (www.QDMA.com). He has worked exclusively in deer research and management for 25 years during which he has presented more than 600 lectures and authored more than 125 popular and scientific articles, book chapters and other educational materials designed for deer hunters and managers.